← 5 social media schedulers and why you need one. finding your voice in the new year. Although it’s probably just my ambitious ego, I like to think I have a third ear for music. I was sitting in a friends living room recently while his iTune’s Genius was mixing us some tunes. There were some songs playing that I had never heard before and the occasional beat would steal my attention from the conversation. Although some of the music was unfamiliar, I was able to pin the artist(s) within just a few seconds once they started singing. Whether his Genius mix played Mumford and Sons, Florence and the Machine, The Avett Brothers, U2 or REM, I really didn’t need to know their whole catalog to identify who the band was. It’s because their lead singer uses an instrument unlike any other: their voice. It’s been about 3 months since the news first broke on their website, that REM is calling it quits. Even for the non-fan, this group has been prolific enough to have several recognizable (if commercial) hits, from “It’s the End of the World as We Know It (And I Feel Fine)” to “Losing My Religion”. 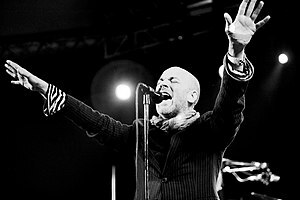 However, more than just the tune itself, their songs are lent that same unclear, (some say mumbling) yet distinguishable voice of Michael Stipe. Be it Bono, Robert Plant, Joe Cocker or John Fogerty, Janis Joplin, Annie Lenox and Karin Bergquist the voices of each define a unique experience for the song. It’s been said that cover bands don’t change the world. There’s a lot of things about a song that can be imitated, from the guitar solo to the cadence of the snare drum. The one element that will never be completely duplicated are the voices. There is just too much nuance, too much subtlety embedded in their vocal chords. Their isn’t a voice like it in the past and their will not be one in the future. Maybe singing isn’t your thing. Simon Cowell has helped a lot of people discover that about themselves. He’s also done a favor to many by encouraging them to find their own voice. If someone was trying to sound too much like Britney, he would let them know. Who would want to anyway? In your context or vocation, there may not be a Cowell to steer you in another direction if you’re trying to sound too much like someone else. No, you may never paint a masterpiece, write a bestseller or compete in the Olympics. Maybe you teach kids to swim. Maybe you direct social media for a small start-up. Perhaps you preach every weekend to a congregation or write blog posts as a hobby. No matter what you do, you have a voice that is inimitable. No one accentuates words like you. No one gives expression to their thoughts in the same way you do. No one articulates their passions in the same manner. I used to spend inordinate amounts of time looking at the kids ministries of other churches. I would peruse their websites, go to their conferences and follow the blogs of their leaders. I’m glad for their influence and their individuality but I am learning to find and celebrate my voice too. Sometimes it’s raspier than theirs, sometimes not as refined or amplified but that’s ok. The world already has its Michael Stipe and Robert Plant. It already had its Shakespeare and it’s da Vinci. We’ve heard from Billy Graham and Gandhi. Now we need to hear from you and you need to hear from us. Thank you for letting me use my ‘voice’ to influence you! Powerful words! Interestingly, the English word “calling” comes from the Latin word for “voice.” You have struck a chord here for sure!